*CH145 God made me as I am (Farrell) A lovely little song. "God made me as I am, part of creation's plan. No-one else can ever be the part of God's plan that's me". Youtube and sign language. Good for kids. 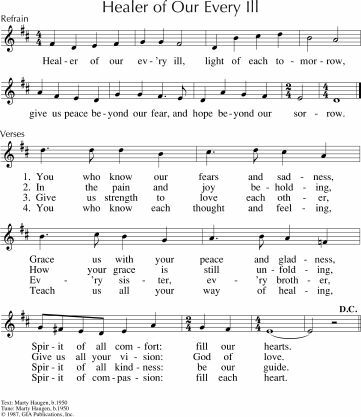 VU862 / GtG028 / PH248 / PfAS139D You are before me, Lord, you are behind (Pitt-Wilson) Excellent words, set either to the chant-like tune SURSUM CORDA or the Scottish tune HIGHLAND CATHEDRAL. The words are directly from the Psalm and are very beautiful. Lyrics. New words to old tunes. AoV2-031 / ATW 424 / CH97 / A&M747 / GtG029 / GC(II)509 / SP301 / StF728 / Lau779 O God, you search me and you know me (Farrell). My favourite version of this Psalm. The tune flows effortlessly and it has a nice little hook at the end of each verse. Sample music and lyrics here. AoV1-021 / ATOK 402 / StS114 / G(II)488 / GC682 / GC(II)669 / G(3)761 / Lau858 God Has Chosen Me (Farrell) Energetic, and great words of justice. Can be rocky or smooth, however you like it. Sometimes it seems a bit long. Good for kids. Sound sample and lyrics. AoV2-070 / ATW 496 / MV090 / StJ Don't be afraid (Bell) Excellent. I love this song of reassurance. "Don't be afraid, my love is stronger. My love is stronger than your fear". This song can be used as a response to intercessions. Good for kids. Sound sample. TiS 674 / Iona (Common Ground, Heaven Shall Not Wait) / A&M562 / CH253 Inspired by love and anger (Bell) Powerful lyrics, simple English folk tune. Lyrics (search for "inspired"). I love verse three “Don’t query our position! Don’t criticise our wealth! Don’t mention those exploited by politics and stealth!”. Tune in The God that I Know (Anderson) A beautiful ballad with female and male images of a loving, embracing God. Sound sample, sheet music sample and songbook here. *Online Resource In You O Lord (Douglass) A gentle Psalm refrain or devotional chant. Sound sample. *ATOK 320 / NCH351 / VU645 / StJ / WoV770 / ELW732 /SFFS 2051 / GtG488 / HPP516 / W&R680 / Cha075 I Was There to Hear Your Borning Cry (Ylvisaker) A song of God’s presence in all stages of life. Very simple tune to sing. This always makes me think of Center Church on-the-Green in New Haven, CT, where I first came across it. Lyrics, and a nice (slow) sound sample. *TiS 613 / AHB 546 / ATOK 405 / CH166 / LBW469 / ELW765 / A&M713 / SFFS2197 / HPP265 / GtG683 / GC578 / GC(II)560 / G(3)663 / CP506 / CP(E) 507 / W&R469 / URW179 / 82Hml-482 / Lau969 / StF526 / MP882 Lord of all hopefulness Lord of all joy (Struther) Excellent straightforward Irish tune (SLANE), and beautiful words. Would be a good choice for the final song. Oldy-but-a-goody. CP517 / W&R503 O God your constant care and love (Lanier) Quite good words about God's presence with us through our lives. Sung to a standard hymn tune. Lyrics and tune sample. *ATAR669 Be my strength (Mann) Words about familiar comforting things, and about becoming older and more frail. Excellent. *CH570 / UMH512 / W&R495 / ZSS164 When the storms of life are raging (stand by me) (Tindley) A good gospel song. Hymnals have a range of translations. Great for kids. Sound sample and lyrics. VU789 / Cha738 A mighty fortress is our God (Response) (Luther) Responsive psalm with sung refrain of the first line of "A mighty fortress". If you don't have these books, I'm sure you could use your imagination to work out something similar. Oldy-but-a-goody. 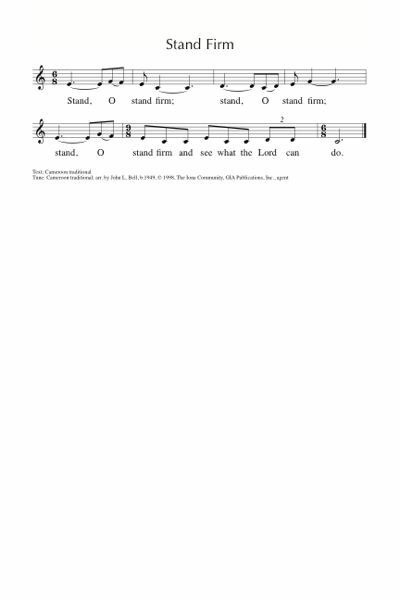 TiS 506 / AHB 430 / A&M424 / CP064 / CP(E) 281 / StF572 Author of life divine (Wesley) Good inclusive words and a simple traditional tune; mystery of communion and seeing God's face. There is also a more modern tune from Carlton Young available from GIA music. Lyrics and sound sample. Oldy-but-a-goody. 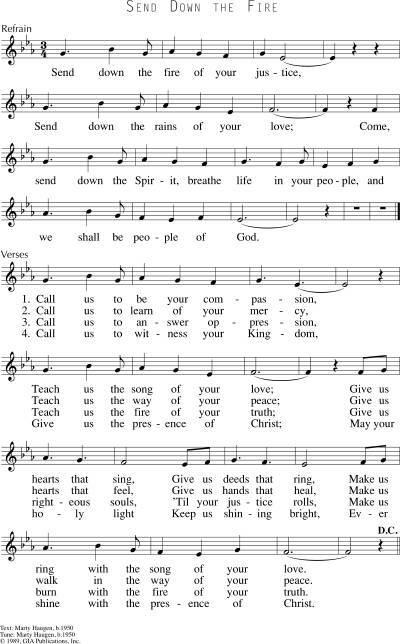 *SP&P057 From the sacred waters of my birth (Grundy) A lovely simple chorus; particularly good if you have a baptism. Lyrics (downloads a PDF). *PfAS071B / GtG813 God my help and hiding place (Duck) A sad and beautiful song based on this Psalm. Imagine you are someone old singing this and it may give you some empathy for what they may be thinking. It's set to a lovely Japanese tune. PfAS071C Since my mother's womb (Guimont) A nice simple Psalm refrain. *Emergent Psalter Don't cast me off in my old age (Everett) A simple, and quite powerful Psalm refrain; can be layered as a round. Sheet music (refrain only). VU305 Into the unshaped silence (Tufts) Lovely words of a new day, a day of rest, and care for the earth. 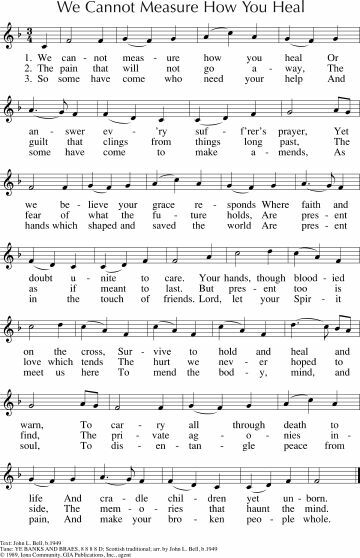 You could choose just one verse and sing it as a round; we did this song not long ago - using the first verses as an opening hymn, and then the last verse as a round during the children's time. I think it would be good to repeat it. The tune is a little mesmerising (it's an adaptation of a Sacred Harp tune BTW). *CH195 / StS053 / AA061 Here to the house of God we come (Murray) Good honest and challenging words and a simple, but unusual tune. Lyrics. CH488 / AA130 Teach us O loving heart of Christ (Murray) Good, powerful words seeking forgiveness for those things we have not done or said. The tune is new, but fairly simple. Lyrics. TiS 706 / Taizé / AoV2-142 / A&M600 / SFFS 2013 / GtG544 / PH224 / GC(II)576 / G(3)620 / CP360 / PfAS103C / SP194 / Src79 / URW377 / Lau813 Bless the Lord my soul (Batastini / Taizé) A beautiful and very well known Taizé chant. Sound samples, sheet music.Good for kids. Emergent Psalter Like the grass that grows and fades (Everett) A simple thoughtful refrain for the Psalm. Sheet music (refrain only). GtG619 / URW075 Praise my soul the God of Heaven (Lyte / adpt Ecumenical Women's Center 1974) This is an inclusive rewrite of Praise My Soul the King of Heaven. I'm not wild about it personally, but you may still find it useful and appropriate for your congregation. Lyrics. TiS 136 / NCH023 / CH187 / UMH121 / VU271 / LBW290 / ELW587 / HiOS135 / A&M806 / HPP45,46 / GtG435 / PH298 / GC626 / GC(II)603 / G(3)644 / CP606 / CP(E) 598 / W&R61 / Cha073 / SP316 / 82Hml-469/70 / StF416 / Lau810 / MP683 There's a Wideness in God's Mercy (Faber) This is a good older style hymn. Not all sources are inclusive, but some (like NCH, GtG, StF) are. NCH013 O my soul bless your Creator (Witt / Unknown) A simple paraphrase of the Psalm, to a well known hymn tune STUTTGART. New words to old tunes. MV184 / PfAS096E Ay ay salidummay (Trational Philippines) I don't know if this would make any sense to a non Filipino congregation, but I'm listing it in case you have someone in your congregation for whom it would have meaning. Here's a sample of a piano teacher playing a more classical version, but it will give you an idea of the tune. *AoV2-164 / GA475 / G(II)327 / GC467 / GC(II)477 / G(3)557 / StF413 Send down the fire of your justice (Haugen) This one is usually sung near Pentecost, but I think it could work quite well with this reading too, particularly if your congregation already knows it. Lyrics and lead sheet. Sound sample. *AoV1-143 Light Of Christ, light flaming bright (Zaragoza) Simple chant. "Light of Christ, light flaming bright, burn in my heart holy fire"; you could easily make this plural if you wish. Good for kids. MV083 / FFS41 Let my spirit always sing (Murray) Good words about becoming frail and old; this reading may provide a space to reflect on what it means to live in a body that doesn't do what it used to, but with a mind and a soul that is still longing to be active. In Every Corner Sing / AA039 / GA192 For the bread and wine and blessing (Murray) Very straightforward tune. Good Eucharist song. Really good song of healing. Tune In: Our God who weeps (Kate Scull) Very simple folk-like tune and challenging and hopeful lyrics. God understands our pain and suffering. Reference recording, lyrics and songbook. CH350 / UMH263 / VU358 / StS044 When Jesus the healer passed through Galilee (Smith) A simple song with many verses (you don't have to sing all of them! ), and a simple "Heal us, heal us today" refrain. This would be good for kids or those who can't read, as they'll be able to join in easily. Verse 6 is particularly appropriate "The lepers were healed and the demons cast out, Heal us, heal us today, A bent woman straightened to laugh and to shout. Heal us, Lord Jesus". Good for kids. NCYC ’93 / ATFG586 We will love / We will walk with you at the edges (Gardener) This is a good little rock number “We will walk with you at the edges, we will die with you at the cross roads, we will risk with you taking chances, we will love”. Or something like that. Jesus broke rules, and that's OK sometimes. Good for kids. VU619 / WoV738 / ELW612 / SFFS 2213 / GtG795 / G(II)642 / GC882 / GC(II)854 / G(3)960 / RS 958 / CP612 / W&R630 / Cha506 / URW161 / Lau427 Healer of Our Every Ill (Haugen) Good straightforward words of healing and simple tune. "Give us strength to love each other, every sister, every brother". Can get overly mushy.Lyrics and sheet music sample. Sound sample.